First Derm is an online service that bridges the gap between an internet search and an in-person dermatologist consultation. Their AI application known as Skin Image Search™, helps assess any skin condition within seconds of uploading user-taken images. First Derm also gives users access to a team of dermatologists ready to provide expert input on any skin concerns. Redesign the visual identity of the Skin Image Search™ as a trustworthy and modern looking product. Help guide users to next steps in hopes of driving revenue and simplifying the user flow. We conducted user research, created low/high fidelity mockups, and a working prototype for web responsive platforms. I redesigned the detailed skin condition page and the photo uploading flow on mobile web. Because we were tasked with redesigning the Skin Image Search, we had to abide by First Derm's existing style guide. One of the first things we noticed is that their main turquoise didn't pass the standard contrast check for accessibility. Following the WCAG 2.0, we recommended two passable color options to the client. After a few design studios, we took our best ideas and began mocking up low fidelity screens for testing. 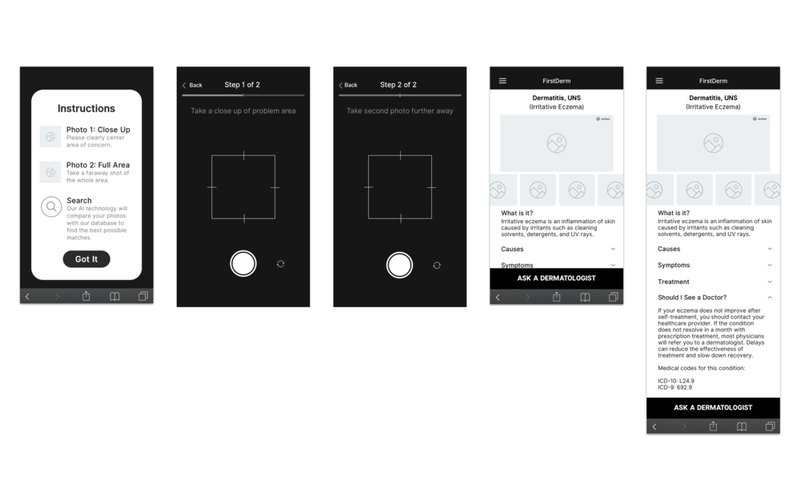 Although we wanted to reduce the amount of steps, we wanted to make it clear as possible to users on the requirements for each photo to upload, not just on the landing page. On the detailed pages for each skin condition, I reorganized the information so users could easily navigate between sections like causes, symptoms and treatment. I also focused on presenting the images in a less jarring manner by adding a carousel so users could preview more photos, in case they were too graphic. The CTA was designed as a sticky button to the bottom of the screen so users could easily access the "Ask a Dermatologist" service, which is the site's main source of revenue. After another round of testing with our lo-fi screens, we made a few tweaks like moving a verified disclaimer below the images to bolster credibility and let it be known that all photos were reviewed and certified by real dermatologists. Below are the results for the Photo Upload Instructions and Detailed Results Page. There is a full clickable prototype as well. Add supportive data such as user reviews, press and testimonials to build more trust and credibility. First Derm's technology has proven to be promising. They've received a few buyout offers from investors including Google. The newly redesigned Skin Image Search is due to launch by the end of 2018. The team I worked with was really great at taking and giving feedback. It was motivating to see how receptive my teammates were, ensuring that we all wanted to create the best product. Through this process I learned how to articulate my design decisions better while identifying the weight behind each choice I made.